Ethical Musings: At what age do you want to die? 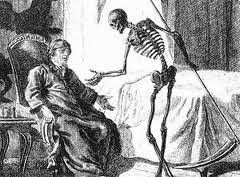 An Ethical Musings' reader called my attention to an essay at The Atlantic, "Why I Hope to Die at 75" (September 17, 2014), in which Ezekiel J. Emanuel explains just that: why he wants to die at age 75. On the one hand, I agree with both of his basic premises. First, he emphasizes that quality of life is much more important than longevity. This premise coheres with Christian theology and ethics. The value of life is not determined by its length but by whom one becomes and how one lives. Emanuel openly acknowledges that death marks the end of life and therefore represents a loss. Prolonging life simply to gain more time many times results in a net loss. That is, those days may come at the price of diminishing quality of life that may include, for example, growing mental incapacity, progressive physical handicaps, or increasingly incapacitating pain. Life expectancy in the United States has increased, but so has the expectation of living with a major incapacity. Furthermore, even for those persons who manage to avoid a major degradation in their quality of life, age inexorably brings with it diminution of one's capacities. Emmanuel's second premise, implicit throughout his essay, is that it is wrong for an individual to burden the community with the cost of care in the face of both the individual's diminishing quality of life and capacity to contribute to communal well-being. The US devotes a staggeringly disproportionate amount of healthcare to the elderly, particularly to the elderly who with less than a year to live. The elderly comprise 13% of the population but consumed 36% of healthcare expenditures (for more statistics, follow this link). On the other hand, I find myself unable to state with any conviction an age or even set of criteria for determining when I want my life to end. There are too many possibilities to make assessing all of the hypotheticals feasible; I am now enjoying life too much to enjoy extensively contemplating my own finitude. Unlike Emanuel, I am not opposed to physician assisted suicide when a person is suffering from a terminal illness and in untreatable pain or is rapidly losing his/her mind to a disease such as senility or Alzheimer's. The idea that God determines when a person dies is incomprehensible to me. If God actually controls the lifespan of every human, why do babies die? Why do people die of easily curable diseases? Why do drunk drivers kill children, teens, and young parents? Why does anyone die a lingering, long-suffering death? These are just a few of the questions for which theological fatalism (i.e., God numbers our days) has no satisfactory answers. Theological fatalism also erodes our motives to relish each day, to live prudentially, and to work diligently to end suffering. My answer to thinking about the age at which I want to die has three parts. First, I want to cherish and live fully every moment that I do have, for life will too soon end. Second, I want to balance enjoying the present with taking care of myself for tomorrow. Although decline is inevitable (and I have no desire to be younger than I am), I do not want to contribute to, much less expedite, that inevitable decline. Third, I hope that I will have the wisdom and courage to decline unnecessary, wasteful healthcare as I near my end. Care that extends the number of my days without a commensurate increase in my quality of life is wrong. Government funds spent on my healthcare that could achieve greater benefits if spent on another person should be expended on that person and not me. In this, I obey Jesus' command to love my neighbor as myself, living into his statement that a person has no greater love than to lay down her/his life for another.